Washington, D.C. — After reports that his administration is once again considering separating families, President Donald Trump claimed that his administration’s cruel family separation policy was an effective deterrent to border crossings. A previous Center for American Progress study found that neither family separation nor family detention were meaningful deterrents, and Tom K. Wong’s new analysis, released today, provides further evidence of this. 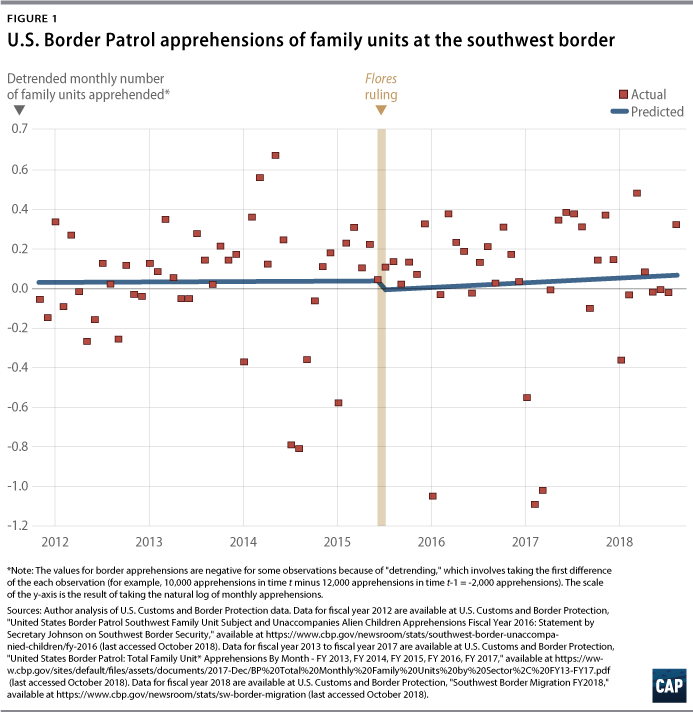 A new statistical analysis of data on the apprehension of families at the U.S. southern border rebuts the Trump administration’s claim in its proposed rule to overturn the Flores agreement that a court ruling in July 2015—which confirmed that the settlement’s protections apply to accompanied children in family incarceration—increased the arrivals of families at the southwest border. The study looks at 83 months of data from October 2011 to August 2018 to analyze the relationship between the July 2015 Flores ruling and the monthly number of U.S. Border Patrol apprehensions of families at the southwest border. 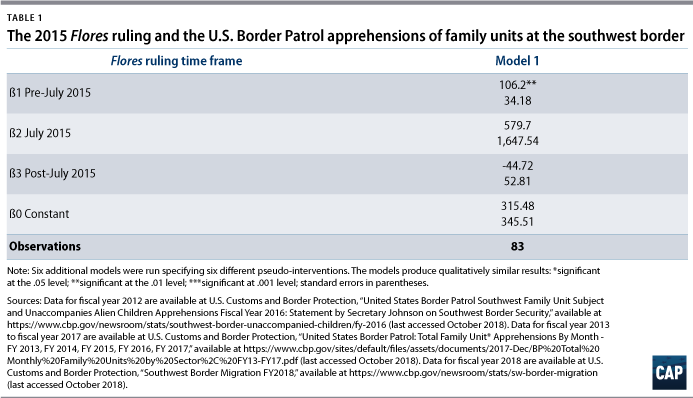 The interrupted time series analysis (ITSA) and autoregressive integrated moving average (ARIMA) models show that there is no evidence that the 2015 Flores ruling increased the apprehensions of families at the border. The conclusion is the same after taking seasonal trends into account: The July 2015 Flores ruling is not statistically significantly related to increases in the monthly number of U.S. Border Patrol apprehensions of families at the southwest border. The methodology is available in the column.